I stopped by the Fort Worth Running Company to get some new running shoes this morning and as I came out I saw a sign pointing me to the Trinity Park Duck Pond. It's been a few years since I've visited the duck pond so I figured I'd stop in and check it out. I was only there for a few minutes but it was a great reminder that if you want to hone your wildlife photography skills it sometimes helps to have slightly-less-than-wild subjects. The ducks at Trinity duck pond - and probably the ducks at the park in your town - are accustomed to having people around. That means you get lots of opportunities to work on your compositions in a very short period of time. Here's one of my favorites. 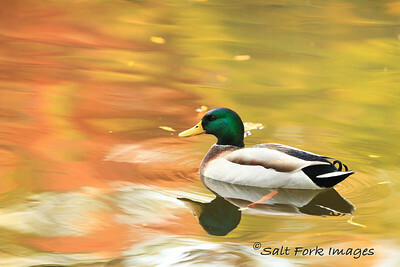 Not only does it show a great Mallard drake but it also reflects the local fall color.